This light was a perfect addition to my closet area. It added a bit of glamour and still provided a bright enough light for me to see when the other bedroom lights are turned off. The elegant embossed crystal design of this lighting fixture will enchant guests and make every night seem like a special occasion. The fixture is flush-mounted with chrome-finish metal and UL-safety listed to ensure that your home will be just as safe as it will be beautiful. This is a charming addition to any room...bathroom, hall, foyer, etc. We put it in a spare bedroom to bring a little elegance and softness to a room with hardwood floors. Gave a shabby chic vibe - "classy on a budget" without looking like cheap plastic. The crystals distract from the fact that you can see the light bulbs through the design so make sure the two bulbs are the same style. Gives off bright glow that gives the ceiling a clean appearance. This fixture was easy to install. It added the perfect amount of elegance to my master bathroom. I love it. 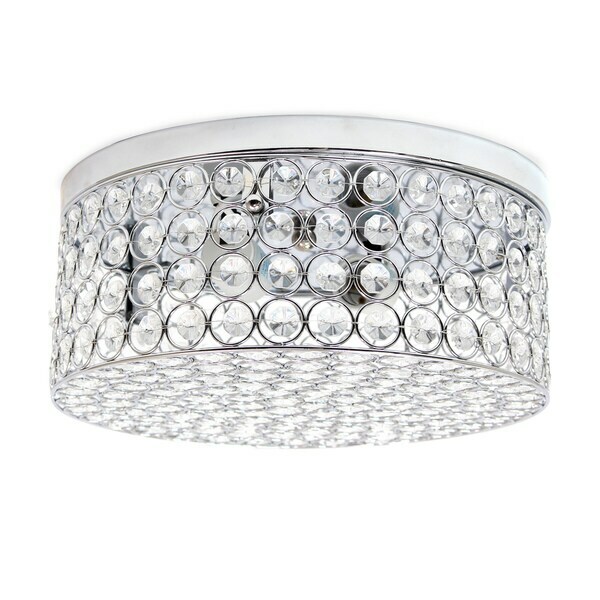 This fixture is fabulous, bright and blingy. We purchased two for the long hall and will get two more for the bath. Highly recommended if you like bling!!! Beautiful light fixture.. love it! I ordered this light for my master bedroom closet because it was priced so well and I had previously ordered this same light in a black finish for my kitchen which was priced much higher. The kitchen light was very easy to install and the "cage" of crystals was very easy to add. I love love love the kitchen light. I installed the kitchen light in less than 30 minutes total. This silver light must be an older model of this style light because it was a royal pain to install with the insulation on the top part which attaches to the ceiling. Additionally, I almost lost my religion trying to attach the "cage" of crystals. It attaches totally different from the black light and the bolts are not long enough. I finally got the light installed and hope the bulbs last a really long time so I do not have to remove the "cage" of crystals any time soon. Once up, the light looks fantastic and casts the same type shadow as the black one. I would recommend it if you have someone else to install it. Otherwise, remember patience is a virtue. Great quality, very pretty, easy to install. I was surprised at the value of this beautiful ceiling mount light fixture we put in our 2 hallways. Couldn't be happier with this crystal beauty. Love how it sparkles on the ceiling and reflection on the crystals are just what I was looking for. 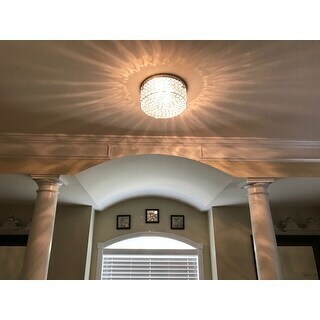 Love this flush mount fixture. It was perfect in front of our entry door. Easy to install, nice design and very functional. It’s everything i just love it. Want some bling? This light fixture has it. I purchased it for a little girls bedroom and she loves it. The cost was good. I like the flush mount so easy to install. 5 stars. 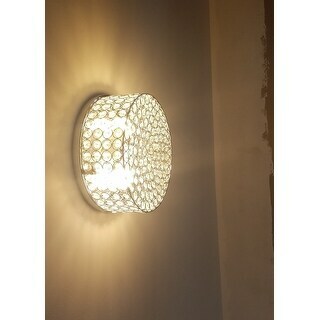 This is such a pretty light and it looks bigger than the dimensions given. Covers the old outlet space which was really important. Classy looking for a guest room in a beach house. I didn't like the curly lightbulbs the electrician put in because they showed every curl and looked awful. I took them out and put two lights I had on hand that I usually use for chandeliers... I wanted clear, but mine had a touch of blue to them and they need to be the same size as a regular bulb stem to screw them in. The inside of the light has a reflective finish at the top that enhances the light and with the new lights it looks wonderful. They blend in and I don't have to stare up at the actual lightbulb. Much better!!! Bought two of these for walk in closets. They are pretty good quality considering the price. They are classy but not over bearing fancy considering the diamond/crystal look. They were easy to install. We got this also due to wanting to cover the old light fixture's base, it was wide and didn't want to repaint the ceiling area. So this fits the wider base if you are looking to cover up old light fixtures. Best light ever. Just love the way it looks in my half bath. 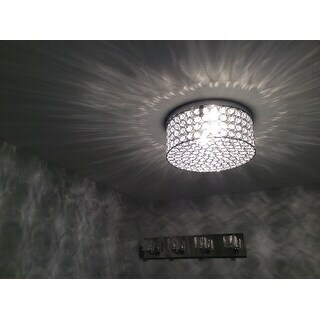 When the light is on the Crystal gives off a beautiful design on the walls not to mention the beautiful light it self. Just the right size and look in my new roomy closet. Nice and sparkly. I Renovate properties,this fixture I've used many times. Good quality plus a pop of sparkle . Absolutely LOVE these. When I removed them from box they looked simple but once installed they made a narrow dark hallway shine like a gem! Really impressed with the level of style and light they have added to our once drab hallway. love it - 10 minute install - ez pz (hardwire but went up so nicely!!) was perfectly packed - i just bought another one! - This one was destined for powder room - but i put it in front hall foyer - it looks amazing!! Nice light for the price! "Can someone please confirm the dimensions...specifically the height from the ceiling down to the finish edge. Picture looks bigger than measurements.Thanks"
"Is the bottom covered so you can’t see light bulbs"
The bottom features the same design as the sides. Please see the 2nd and 4th images. "Is this lighting fixture damp rated?" No, this is not damp rated. "Is this light okay for use in bathroom with shower?" you can definitely see the bulbs from any angle. "Is this 10 inches or 12 inches in diameter? The title says 10 but the description says 12." It is 12 inches and it is so beautiful Everyone that sees it absolutely loves it.